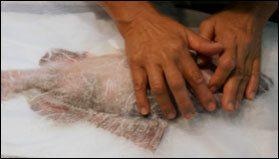 Gyotaku artists in Hawaii have developed a method of gyotaku that ensures that the fish remains cold and safe to eat after the printing process. In this workshop we will be creating gyotaku Hawaiian style, using sumi ink and adding color to the print with watercolors. 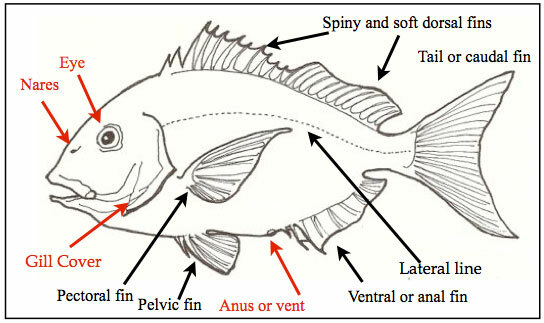 The traditional paper used for gyotaku is “rice “ paper. A more proper name might be handmade or oriental paper, because rice paper is not made of rice. One early type of paper was made from the inner bark fibers of the rice pa- per plant, (Tetrapanax papyifer), a tree native to Taiwan. 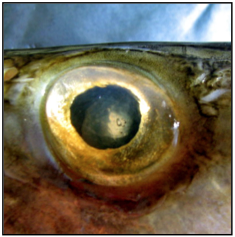 You have just taken a print from your fish, and did not ink the soft membrane of the eye. As a result there is an empty orbit in the head of your gyotaku. 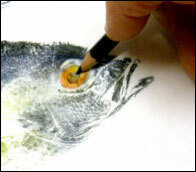 These instructions will lead you step by step to recreate the eye with both a water and a drawing medium. Although painting the eye with diluted printing ink is a common choice, there is no rigid medium for this final touch.